My issue with DSLStats is that I am running it on an iMac using Nallar's Docker version. When I look at where the snapshots are held it gives the location as /root/.dslstats/, which presumably is where the files will be stored under Linux. However this doesn't relate to an identified location on teh Mac. Is it possible to access these files? When you first ran the container, you should have specified a -v flag. In Docker, this mounts an external directory path from your host inside the container. The setup instructions specify that you should mount an external folder on to the /config directory internally - so anything inside the container that's written to /config will be persisted and accessible on the mapped folder on your external host (in this case, your iMac). Mount an additional volume in to /root/.dslstats in the container. This will persist and make available any data written to that folder. I think the problem is that the directory locations on offer are the Linux choices and IO can't point it to something meaningful from a Mac perspective. I have also just tried to set up the web server configuration and can't get any joy in terms of being able to access the stats. 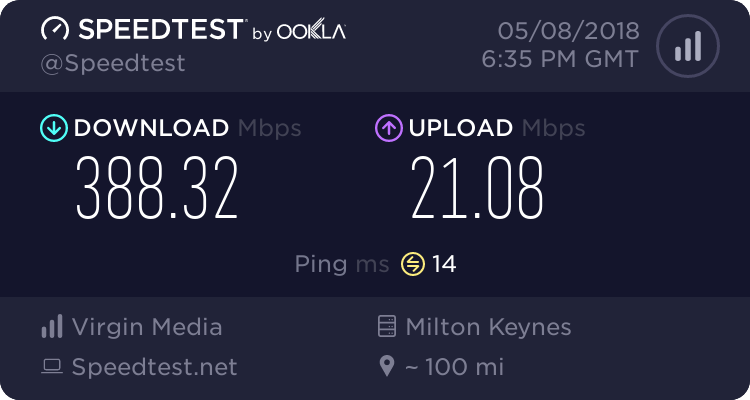 I am running a Netgear Orbi so have the PC on the Orbi LAN as 10.0.0.2 and have separate network configuration set up with the iMac as 192.168.1.100 for picking up the sats from the modem. Trying to access either 192.168.1.100:55555/snrm.html or 10.0.0.2:55555/snrm.html just gives me a site not reached message in Chrome. Am I missing something or is this just an issue with running DSLStats under Docker? Might it be possible to extend the time per page on DSLstats graphs to more than 24 hours? Up to 7 days or even a month would give more MDWS like visibility of things if you don't look at things every day. If a week is possible then an option to save snapshots every 7 days would be nice. If a month is possible I think the monthly option is already there. This would also make looking a things back in time via the saved snapshots a much easier task. I have no idea how easy or hard that might be. I doubt that it would matter if for graphs longer than 24 hours days the sample times needed to have a bigger minimum value. Yes I was looking at google charts last night. In fact I was actually looking at their Line charts here. But its not quite so simple as having the charts, you'd also need something which would accept the data from DSLstats, update the data then send it to be able to graph it to the chart. If you were running it on your own website, you'd need to update and retain the data. I'm not sure how its currently done, but last night I was looking at the info sent from kitz_live_modem_stats.log. It's currently sent as space delimited file, so first step would be to break down into an array for each item, something like the function explode should do that. You'd then need to identify what each stat in the array is and name it, so you can identify which piece of data you want for the particular graph you want to display.... and that's just the easy bit. There's lots of other areas you need to think about. - You'd need .html templates to output the graph to. Although GDPR is one of the reasons Tony cant do this any more, its not the only reason. The server is also showing signs of overload recently with a rapidly increasing user base and would likely need a rewrite to get over this. Think about it, his database is currently holding data for many hundreds of users. For each and everyone of those users there is rows upon rows of data being updated every minute for numerous types of graphs. He had a pretty decent spec server running in his own home, so if there were any probs he could quickly fix his code and have control over his own db. To be honest given Eric's situation with his time available I think the best answer is for some form of file saved as perhaps a zip file containing the data currently sent to MDWS. As long as the format is known then it would be easy for individuals to decide whether or not it is worth it for them to create some kind of database to contain it or just to archive it in case it is needed. As has already been noted the saved graphs etc can contain pretty much all the data needed. I have started archiving this off to my NAS pending something more compact being available. With hg612 stats it saves all the stats to one log file, although I do split them off every year, so the stats data is always there. Theres also the graphs but unless manually run are only for a 1 day period. My brother might be tempted to write something for better on the fly graphing, but given his total lack of time I'm not holding out much hope. Think most graphs are a rolling 24h (ES isnt though for me). Having the ability to increase the timeframe covered for all charts would reduce the need for as many snapshots. @les-70: also on the list. I could make it a CSV file, but DSLstats has some users in countries where they use a comma as a decimal point. The other zipped files for HLog, QLN, etc are in CSV format because all the values are whole numbers.